Federation Square is the creation of a new urban order on a site that never before existed. more than just a new set of buildings, federation square is the new centre of cultural activity for melbourne. fulfilling the long held dream for a large, open public gathering space in melbourne, federation square gives the citizens of victoria an authentic civic destination. in the true spirit of federation, this design brings together distinct elements and activities that form a complex ensemble based upon the collective and the unique. within an architecture of difference and coherence, the design has brought together these disparate institutions and allowed their true differences to be registered in the developed geometries, while also maintaining a visual and formal coherence across the site. importantly, the design has also sought to produce a cultural and civic precinct based upon permeability, allowing for the interaction of visitors, precinct workers and the passerby. 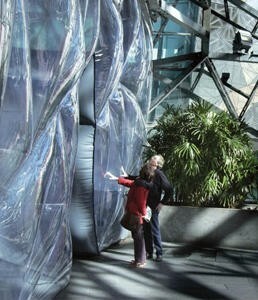 federation square is a re-affirmation of the original interactive nature of civic exsistence. rather than a closed enclave of controlled and regulated activities, this project creates a network of animated, emotive and enlightening experiences. federation square integrates a broad range of civic, cultural and commercial activities, responding to the vitality and openess of daily life.